This large, attractive apartment building was designed by J. E. R. Carpenter, the foremost architect of luxury residential buildings in the city of his generation. His other buildings on Fifth Avenue include 810, 825, 907, 920, 950, 988, 1030, 1035, 1060, 1115, 1120, 1143, 1148, 1165 and 1170 as well as 2 East 66th Street. The building was developed by August and Pauline Schmidt, the owners of the Lion Brewery in New York and completed in 1924. In his excellent book, "The New York Apartment Houses of Rosario Candela and James Carpenter" (Acanthus Press, 2001), Andrew Alpern notes that the Schmidts retained ownership of the building until 1987 when it was bought by the Goldstein family for $23.5 million and was converted by the Goldsteins two years later to a cooperative, but the Goldsteins "retained possession of the original maids' quarters that occupied a rooftop penthouse structure, along with rights to the surrounding roof area." "In 1997," Alpern continued, "they constructed three new penthouses to replace the maids' rooms. These 1600- to 2000-square foot, two-bedroom duplexes with 19-foot-high living room ceilings were built four feet above the roof level as clearance for necessary structural and mechanical support elements." This building and its alterations are quite similar to 1148 Fifth Avenue, directly across 96th Street, which was also designed by J. E. R. Carpenter. In his book, Mr. Alpern notes that two days after the filing of plans for 1148 Fifth Avenue, "the Board of Estimate limited building heights on upper Fifth Avenue to 75 feet." "Owner/developer Mary Jennings," Mr. Alpern continued, "filed a mandamus action claiming that her filing two days before the passage of the zoning change entitled her to a building permit. With the support of James Carpenter who vigorously opposed the height ban, she won and construction began more than ten months after the filing date. In 1950, roof-top maids' rooms were converted into penthouse apartments, and in 1994 the penthouse parapet wall was cut down, the top floor facade was altered, an an iron railing was installed to provide a park view to the front penthouse apartment (similar to alternation made in 1932 to 1030 Fifth Avenue)." While not as grand as some of Carpenter’s other buildings further south, or 1158 on the same avenue blockfront, 1150 Fifth Avenue has very handsome apartments, many with large entrance halls. 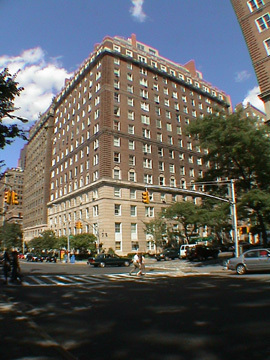 The building has a four-story limestone base, extensive sidewalk landscaping, a doorman, a concierge, large attractive layouts with large entrance halls, good views of Central Park, and a large lobby. It is at the exit of the eastbound 96th Street Central Park transverse road, but, fortunately, the westbound traffic across the park uses 97th Street. The cross-street here is quite handsome and many important cultural institutions are nearby to the south on Fifth Avenue’s "Museum Mile." The Carnegie Hill neighborhood here has many fine schools and attractive restaurants and religious institutions. A local subway station is at 96th Street and Lexington Avenue and Mt. Sinai Hospital is a few blocks to the north on Fifth Avenue. A large children’s playground is just within Central Park on the south side of 96th Street.